Millennials – Are their needs different? Millennials are thought of as “snowflakes”, needing immediate gratification and recipients of participation ribbons for sports events they entered as children. Significant time and money have been spent to understand how to market products and services to them. When it comes to your business, how does your company successfully recruit, hire, and compensate millennials? 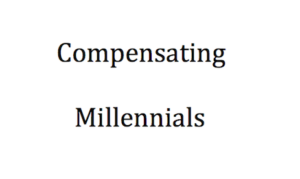 What is unique about compensating millennials? What isn’t unique? We are all unique. However, based upon the amount of research and available data, we have more information at our fingertips about millennials than any other generation. What is also not unique is that employees of every generation today are averaging about 3-5 years in the same job. Millennials are not job hoppers. The employment marketplace has changed from a 30-year stint to a much shorter one. It is important to understand the changing marketplace as much as it is to understand the members of today’s marketplace. Remember that today’s employees are either glued to your organization or loosely connected. We know more than Santa does when millennials have been naughty or nice. Yet they continue to be a mystery. 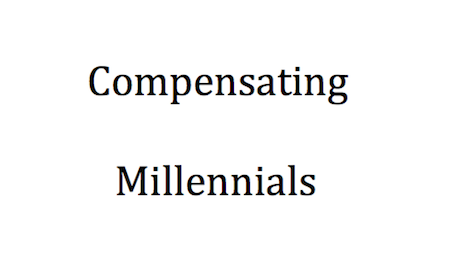 How do you motivate and compensate a millennial? Should companies pay millennials in Starbucks Gift Cards, Bitcoin or Carbon Credits? Probably not. Should Millennials be awarded a participation ribbon for simply arriving at work and staying there for an entire day? Definitely not. Should Millennials feel inferior because they did not have the experience of eating a TV dinner watching Mutual of Omaha’s The Wild Kingdom while Marlin Perkins narrated from a studio and Jim Fowler climbed in a tree in the African bush to avoid a rhino attack? Of course not. Are you over thinking recruiting Millennials? Probably. Is the massive amount of available data about Millennials overloading our ability to recruit and compensate this generation from an objective point of view? Why are we making this into such an issue? It is a critical issue for businesses to hire the right talent, especially the next generation who will soon become our business leaders and CEOs. Isn’t this another classic reminder that change is a constant part of the world of business? With change comes the need to reevaluate what should remain the same and what needs to change. – The Millennial Generation is simply a label given to a group of people in a similar age range. Generations have been coming and going forever. There is even a group that has been labeled “The Greatest Generation”. At some time soon, the millennials will be dealing with a younger generation who will make the millennials look like boring, stable adults. – The millennials should be applauded for not simply accepting the world they have joined, but instead do their best to make it better. Anyone in the Baby Boomer Generation was once in their 20’s and full of idealistic thinking and a desire for change. – To attract, hire and compensate millennials, we first need to respectfully appreciate their sense of urgency/immediate gratification along with their desire for work-life balance and the need to make a difference. – A job for them might mean they disconnect from work email or work texts during non-business hours and volunteer their free time for a social cause. – Attracting them to your company could mean changing how you word the position description so it is more relative to them. What remains unchanged for Millennials? 1. A business has challenges and needs. 2. Members of the workforce need to address the needs and solve business’s challenges and problems. 3. Business people must deliver value to their employer. 4. This directly applies to every member of every generation. 5. Successful businesses establish clear goals and objectives for their employees. 6. Employees who meet and exceed their goals and objectives are more valuable to a business than the employees who do not. 7. Employees who meet and exceed their goals should be rewarded. All members of the business community like immediate gratification. For example, receiving a performance bonus every six months is a much more effective program than paying out the annual bonus 3-5 months into the next year. At that point, no one remembers what they did to earn the bonus and the value to reinforce employee performance has been lost. 8. Since the inception of the business, new generations have come along with a desire to leave their mark. Regardless of a generation’s nuance, what remains unchanged is the need to deliver value to the employee and the need to deliver compensation to the employer. How to recruit and compensate Millennials? Why does hiring & compensating continue to be a conundrum? 1. Businesses must first define and declare their needs and challenges. 2. The employees need a path for success also known as goals and objectives. 3. This approach follows the “Manage by Objective” or MBO philosophy. 4. Well designed MBO’s have proven to deliver value to businesses and have compensated talented employees for their superior work. 5. A good MBO consists of base salary plus performance compensation. Add the two together and it is called On-Target-Earnings. Provide the employee with clear goals and objectives and it is called a Path for Success. When interfacing with millennials, remember that a pat on the back or the compliment of a good job can go further than you might think. Tell them that they are making a difference. Good business leaders recognize the importance of communicating and motivating their team. They view their team as individuals as well as team members. They need to speak to their audience with their audience in mind, which includes their customer as their audience or their millennial employees as their audience. Millennials are a critical part of a business’s success. However, they are also part of a generational pattern that will cyclically continue. Let’s get on with it and address the business issues that matter. Change is constant. recruiting & hiring the right talent is critical. Compensating for the completion of goals and objectives has proven to be timeless. Good hunting (for critical talent).